The expedition of Neil Armstrong and the Apollo 11 crew is one of the central myths in American history and global pop culture. The moon landing was perceived as a symbol of the victory of democracy—the American Dream as one giant leap for mankind (and going where no Russian had gone before as well). No film has really dealt with the economic and human toll of this triumph before, and after the successes of Whiplash and La La Land, Damien Chazelle has chosen this story for his first period piece, tackling the ambitions and worries of a distant era and looking like the latest graduate of the Spielberg and Zemeckis school of cinema in the process. Chazelle does not simply relate Armstrong’s tale in terms of hero worship. 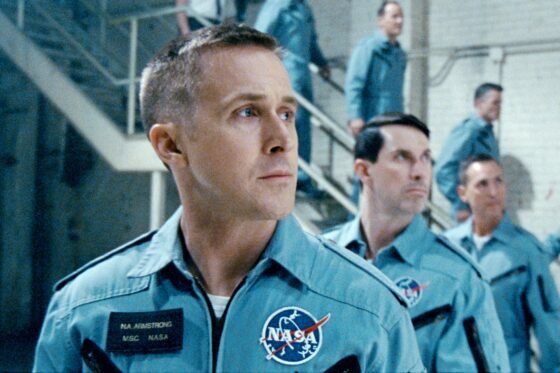 In fact, quite the opposite: First Man could easily be called “Neil Before Armstrong.” The film recontextualizes Armstrong (Ryan Gosling) and his expedition for what it was: a tool in a political struggle, and one that required long preparation and was subject to intense criticism. The material works well for Chazelle, who always makes movies about artistic searchers who subsume the people around them into their passions—protagonists who are not fully adapted to society and behave as outsiders and individualists. The idea of family is not a recipe for happiness for these characters, although there are some moments of carefree joy here with Armstrong, framed as ’60s-style home movies. The true heart of the film, then, is Armstrong’s wife Janet, played by The Crown’s Claire Foy, who serves as the perfect mediator between her own adolescent sons and the overgrown “lost boys” playing in space. Armstrong’s trip becomes a means for emotional emancipation, a backdrop for an intimate, universal story about dealing with trauma.